Easy Money Manager is an open source .NET application that allows you to manage your personal finances. Here we show a real-life application using VirtualUI’s GUI virtualization capabilities. These Applications are hosted in our cloud servers, so you’ll have a better user experience if you chose the one closest to your location. Fish-facts is a simple database application that provides basic information about fish species. 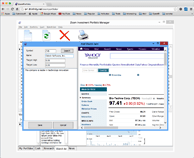 This live demo gives an example of how basic GUI virtualization can be integrated with the web browser and external web resources. These Applications are hosted in our cloud servers, so you’ll have a better user experience if you chose the one closest to your location. Zoom Investment Portfolio Manager is an open source Delphi application that provides a simple and convenient way to keep track of your stock investments. This is another practical example of VirtualUI’s GUI virtualization capabilities. These Applications are hosted in our cloud servers, so you’ll have a better user experience if you chose the one closest to your location. This demo shows you how to stream a video to a native HTML5 video component. Videos will run in the web browser to full native speed!!!. These Applications are hosted in our cloud servers, so you’ll have a better user experience if you chose the one closest to your location.